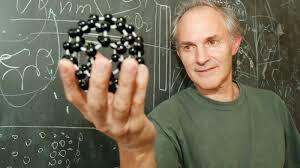 I heard earlier this afternoon of the death at the age of 76 of the distinguished chemist Sir Harry Kroto. Along with Robert Curl and Richard Smalley, Harry Kroto was awarded the Nobel Prize for Chemistry in 1996 for the discovery of the C60 structure that became known as Buckminsterfullerene (or the “Buckyball” for short). Harry had a long association with the University of Sussex and was a regular visitor to the Falmer campus even after he moved to the USA. I remember first meeting him in the 1988 when, as a new postdoc fresh out of my PhD, I had just taken over organising the Friday seminars for the Astronomy Centre. One speaker called off his talk just an hour before it was due to start so I asked if anyone could suggest someone on campus who might stand in. Someone suggested Harry, whose office was nearby in the School of Molecular Sciences (now the Chichester Building). I was very nervous as I knocked on his door – Harry was already famous then – and held out very little hope that such a busy man would agree to give a talk with less than an hour’s notice. In fact he accepted immediately and with good grace gave a fine impromptu talk about the possibility that C60 might be a major component of interstellar dust. If only all distinguished people were so approachable and helpful! I met him in campus more recently a couple of years ago when we met to talk about some work he had been doing on a range of things to do with widening participation in STEM subjects. I remember I had booked an hour in my calendar but we talked for at least three. He was brimming with ideas and energy then. It’s hard to believe he is no more. Harry Kroto was a man of very strong views and he was not shy in expressing them. He cared passionately about science and was a powerful advocate for it. He will be greatly missed. This entry was posted on May 1, 2016 at 6:08 pm and is filed under Biographical, The Universe and Stuff with tags Buckminsterfullerene, C60, Fullerene, Nobel Prize for Chemistry 1996, Sir Harold Kroto, Sir Harry Kroto, University of Sussex. You can follow any responses to this entry through the RSS 2.0 feed. You can leave a response, or trackback from your own site. Harry was a fine example of a scientist driven by his belief in the rational. We are all the poorer for his passing. What sad news. The discovery of C60 was game-changing, and I remember doing a piece of work on it during my undergraduate degree. Can’t believe he is dead! Sadly it is true. Confirmed by a number of sources. He was a huge help with my (successful) campaign to save the Royal Institution a couple of years ago. Indeed. One of many causes he devoted time and energy to, with great effect. I went to a talk he gave a few years back at the Royal Institution. My main memory is his criticism of funding schemes – he said that none of his major discoveries would have made it through current Research Council funding hurdles. An inspiring speaker. Difficult for me to believe that Harry Kroto pased away this evening. I had the privilege to meet and get to know Harry when he first came to the Rice University campus to collaborate with the late Rick Smalley and Robert Curl was in 1985. I will always remember Harry as a passionate chemist and an enthusiastic collector of rare books. I took one of his undergrad courses and he was unique for his passion and enthusiasm. Terrible news. That’s a loss – a magnificent scientist. This news deserves more prominence than that of some deaths this year, the BBC’s website notwithstanding. I’d gladly go to a secular memorial for such a man. Theists such as myself can always pray privately. I see on his Desert Island discs selection his top choice was Mahler Symphony No. 4. Surprised the news still hasn’t reached the BBC or any mainstream media that I can see…. The dearth of mainstream coverage no doubt explains with this blog post is generating so much traffic. I heard it first from a friend of his family and then independently from two other sources. I can understand the media wanting to be sure, and it must also be difficult to get confirmation without intruding on other people’s grief. I now think that the BBC have only a skeleton staff on a Bank Holiday and that their failure to honour him promptly is a poor show. Can’t believe they found the time to report on the death of an astrologer but not a Nobel prizewinner! I would rt your message but I seem to be blocked. Blocked? How odd. My twitter is totally open…. Along with Hermann Bondi, Thomas Gold, Wolfgang Rindler, and others, he fled the Nazis and started his career elsewhere. Originally called Krotoschiner, the name was shortened to Kroto, leading some to think that he might be Japanese. Actually Harry Kroto was born in England. Right; it was his parents who fled. He was a very nice fellow. I joined him and others a couple of times in the late 90s to lobby John Battle (then Minister of Science) for Save British Science. Harry was at once enthusiastic and charming. Great example of British Science. RIP. That is very sad news. Like Peter, I recall talking to him when I was at Sussex when he would drop by the department. He was always very generous with his time and his ideas. He will be sorely missed. I had the privilege of working with Sir Harry Kroto during late 90′ s at Sussex for a brief period and was an amazing scientist and wonderful human. It is unfortunate that he is no more with us. His enthusiasm for science teaching, passion for discussions on science related issues was incredible. I had walked into his room number of occasions without appointment for discussions on fullerene related discussion. I feel deeply saddened that both Dr David Walton (Kroto’close associate at Sussex) and Prof Kroto are no more. My heartful condolences to his family. Rest in peace. Sivaraman, India.